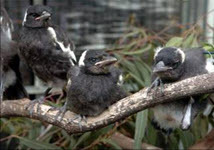 Australian Magpies belong to the same family as the Butcherbirds and Currawongs. They are found in areas in which there are trees (used for shelter, nesting and roosting) and bare ground or grassy areas in which to feed. 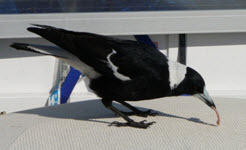 Magpies are omnivores and forage on the ground, turning over loose material, probing into the ground with their beaks and hawking slow-flying beetles and grasshoppers. Food consists of a wide range of invertebrates, small reptiles, frogs, small birds, mice, occasionally carrion, seeds and berries. Their more favoured foods include weevils, ants, grasshoppers, spiders (and their egg sacs) and earthworms, They accurately locate their prey by sound and sight using noises or surface soil movements made by the invertebrates. Males are about 10% larger than females in size and weight and have slightly longer beaks. Young birds attain full size at the end of their first year but still weigh slightly less than adults. Generally the birds are at their lightest in summer and heaviest in autumn. A healthy adult from the Sydney region weighs approximately 300-350g. The first moult is at 3 months of age after which a buff white eyebrow appears. In the bird’s second year the beak becomes progressively whiter from the base and full adult plumage occurs. The eggs are laid at least a day apart, and hatching which occurs after 20 days is staggered. The young spend four weeks in the nest before they fledge, able only to flutter and not fly. For the first two weeks after fledging the young are fed almost entirely by the parent. As the juveniles get older their hunting skills improve and the adults become more reluctant to feed them (the parents will peck the juveniles when begging calls are made). Eight weeks from fledging the youngsters have similar hunting skills to adult birds. 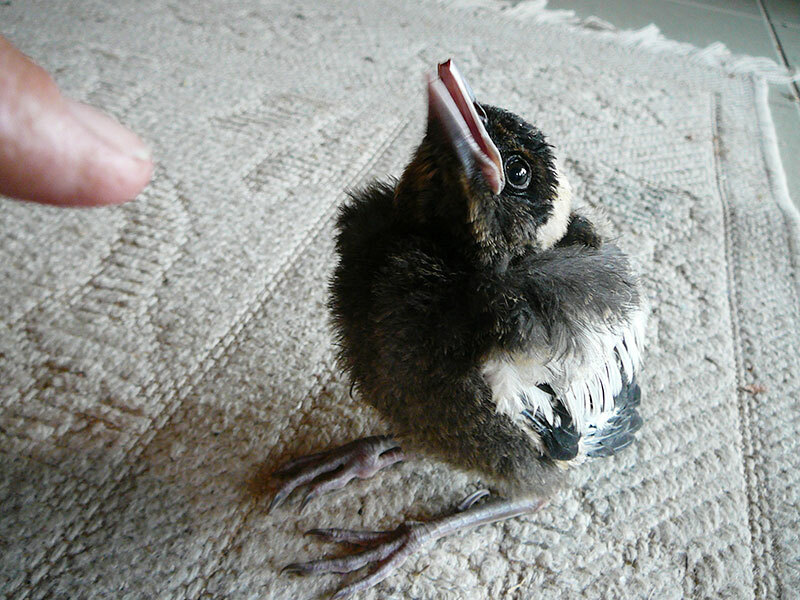 “Stupid”, a young magpie came to me having been reared from a nestling by some well-meaning people. “He loves to play with our little white dog” they explain. Oh dear! I put him in the aviary with the other juvenile magpies. “He will soon learn to be a real bird”. Eventually the time came for the magpies in my aviary to be released. All went well, except for “Stupid” who flew into my home to play with my little white dog. My dog plays a different game from his first friend and he tried to catch “Stupid”. When the bird was cornered and his life in danger he stood his ground and stared at the dog, letting out little “don’t hurt me” squawks. Dogs soon tire of things that don’t run away, so an understanding was achieved. I have a pet duck in the garden. “Stupid” decided to become a magpie/duck. He would follow “Mucky” around imitating his scratching and when the hose was on to stand underneath it having a lovely soak together. He didn’t swim in the pond but stand on the edge splashing the water as “Mucky” swam. My local fierce territorial magpie fed him initially, as he does with all my released juveniles. But after a time he decided to tell “Stupid” to fly off. “Stupid” stood his ground, squawked his “don’t hurt me” squawk. Once again he won. Big magpie got tired of trying to shoo away a bird who wouldn’t obey and allowed him free run of the back garden and to roost in the tallest gum tree, just so long as he didn’t go near the front garden. One night the heavens opened and the rain came down in torrents. Where is “Stupid”? The garden was so quiet. No begging, no bird under my feet. I searched for feathers, I weeded the garden in my search for a dead body, I chopped back the shrubbery. No “Stupid”. Three quiet days later the sun came out again and “Stupid” was once again waiting at the back door. No explanation was forthcoming but I suspect he blamed me for the weather and went off looking for someone more kindly. Eventually, persuaded by my big magpie he went on his way and joined the roaming bands of juveniles searching for a home and mate. I hope he made it. The song of a magpie – “quardle, oodle, ardle, wardle, doodle”. Try saying that quickly!